I wrote this blog whilst on holiday in Munich and Nuremberg. I'm not pretending to be an expert on German beer history or drinking in Germany. This is merely the impression I took away with me and a collection of observations I made. It would be interesting to visit the north of the country to see how/if things differ. Unlike in England, there doesn't appear to be any "free houses" here. Bars (or Brauhaus) are tied to a single brewery and only sell beer from that one supplier. As with tied pubs in England, that supplier tends to be localised and the product offering doesn't vary greatly from one place to the next. This may be painting a slightly negative picture, so allow me to stop myself. Whilst you might know what's on offer before you set foot in the door, you also know that the quality of the beer on offer will be excellent. Such is the thirst for beer in this country, that you get the feeling the locals would accept nothing less. Favoured styles form the trio of: Heles, Dunkel and Weisse. Helles or Hell: A pale, clear lager with a crisp, clean taste and moderate bitterness. Dunkel: Dark chestnut in colour, a sweet start leads to malty yeast flavour. Weisse: Brewed with a high percentage of wheat in the grist and (more often than not) unfiltered. Sweet banana and clove yeastiness dominate the flavour. Styles aside, for a drink to be called beer in the country, it must adhere to the Rheinhetsgebot (circa 1430 - 1490). Literally translated into English as "Purity order", this law states that if a drink contains anything other than barley, yeast, water and hops, it can't be called beer. This is in no small part responsible for the excellent quality standards I mentioned earlier. It appears to breed a reverence for beer, an attitude that beer is something special and must be kept sacred. What results are beers of character and distinction, always served in top condition. But you know what? Attitude is something I also want to criticise. In a similar way to how most drinkers lazily pick up a soulless macro lager in the UK, I can't help but feel the same is sometimes true of the way a beer is ordered here. You drink enough quality beer in the way it's consumed here and you must begin to take it for granted. You must stop taking a second to dissect and appreciate that stein of beer in your hand. When I go away on holiday, that first cup of tea back in England tastes better than the ten I had before I left. It tastes better because I've missed it, I've looked forward to it and, most importantly because I'm concentrating on it when I drink it. Maybe I'm being hyper critical, but I can't help but get a slight feeling that beer to a German is as tea to an Englishman. Love it dearly, can't live without it, but every now and again we're guilty of taking it for granted. Negativity again. Let's talk about another big beer related positive that I've picked up on during my time here. Beer and food. Save for perhaps a can of lager in an unlicensed curry house, beer with food is pretty much non-existent in England. Not so in Germany. Walk in to any restaurant or Brauhaus and the beer is proudly displayed on the menu next to the main courses, with only a small section at the back reserved for wine. 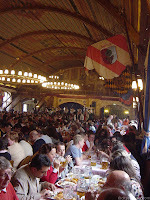 A Maß of beer with your Rostbratwurst is as run-of-the-mill as salt and vinegar on your chips. And why not ... the combination is, more often than not, delicious. People here are beer lovers, they regard beer as a drink for everyone and for all occasions. The focus is on locality, provenance, quality and character. As a visitor, the appreciation of that culture and mindset is magnified. I recommend this part of the world to any fellow beer lover. Come and see it for yourself, you'll find it difficult to leave without having had a good time. But first, drinking a lot of something doesn't mean quality will be high. Thinking of the average quality of a cup of tea in the UK, well most of what's drunk is bog standard. There *is* better tea here perhaps than in most countries, but it's a minority. Rather, it's what you said at the end - quality is driven up when people are interested in what goes into what they consume, and where and how it's made. And as for the Beer Purity Law, I don't think it's been a good influence at all. It drove to extinction many of the more unusual styles, that we see in Belgium for instance. It allowed certain brewers to have a (partial) monopoly, since if you brewed anything non-standard, it was banned (and prevented the import of many foreign beers until quite recently). I'm glad we don't have anything like that (although the state of the UK mainstream industry is nothing to be proud of). Valid criticsm isn't the same as just being negative for the sake of it, no worries there! Agree with you that volume doesn't equal quality. I think in Germany beer is such a big part of life that bad beer would just fail through non-sale. I understand completely what you're saying about the purity law limiting creativity. Don't think anyone could really argue with that. Equally though, it has sort of resulted in a reverence for beer amoung the drinking public and has prevented the dumbing down of beer through cereal adjuncts etc that we've seen in other parts of the world.